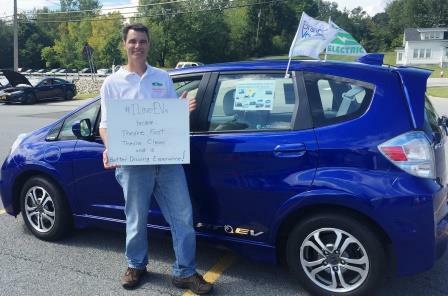 As National Drive Electric Week comes to a close we wanted to give one last big shout-out to electric vehicles. We spent last weekend at Guptill’s Arena in Cohoes with the Capital District EV Drivers Group speaking with various EV-owners. Not surprisingly, I didn’t meet an EV-owner that didn’t love their car. In fact, it was hard to get them to tell me the downsides to owning an EV. Among st the EV line-up were several Teslas, Nissan Leafs, Honda Fits, Mercedes B-Class, Chevy Volts, VW E-Golf, Ford CX-Max, Ford Focus, and even a Toyota Ray4 all the way from California (sshhhh don’t tell Toyota!). 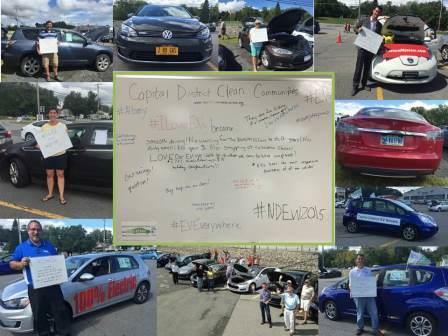 In the Capital Region, 96% of commuters have a round-trip commute less than 60 miles, which is within the range of an EV. Since New York’s power grid is one of the cleanest in the nation, if gasoline-powered vehicle owners switched to EVs, we can reduce emissions by 75% per mile. Plus, power is local and instead of paying for gas, which mostly goes overseas, your dollars can stay right here in the Capital Region. In celebration of National Drive Electric Week the U.S. Department of Energy released its new EV Everywhere: Get Connected! website. Visit the site to find an EV model that works for you and your family, learn about even more benefits of EVs, how you can save on fuel and vehicle costs, and EV stories from other people’s experiences.